Strange... strange... strange... is the best way to describe this bizarre yet thoroughly entertaining anime that revolves around two characters named Pandy and Retro who awaken on planet Earth with no recollections whatsoever of their past. Unfortunately with nothing to base their existence on and unable to sustain themselves, the duo turn crime. Caught by the authorities, the pair are sent the deadly and infamous penitentiary that is aptly titled "Dead Leaves" but upon further investigation, the penitentiary is actually a top-secret cloning facility that is controlled by black op corporations that goes from hell to worse as these two new inmates do their best to usurp Dead Leaves. Apart from the engaging storyline of Dead Leaves that was created from the makers of Blood: The Last Vampire and the Kill Bill anime feature could easily be considered the next generation of anime movies with its ultra-violence, ultra-cool storyline that is definite the ultra-anime. 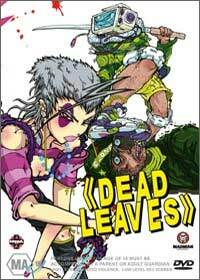 For those want a slightly different anime than main stream should really check out Dead Leaves because after 80 minutes of this movie, it will leave viewers wanting more. Presented in Dolby Digital 5.1 with 16:9 widescreen, Dead Leaves is a must have!